I know we are all here getting away from the A series but I think largely the issues that people cite for this is more down to the gearbox than the actual engine. I remember at one of the first big Mini birthday parties they had a "fastest Mini in the world" type race and there was a bit of "foul play" called as I recall the rules stated that the car must be FWD and use an A series engine and gearbox. One smart cookie decided that an A series gearbox is any gearbox bolted to an A series engine and built a race A series on a Maestro gearbox. The 1.3 Maestros actually used an A series engine on a transverse "normal" type gearbox. 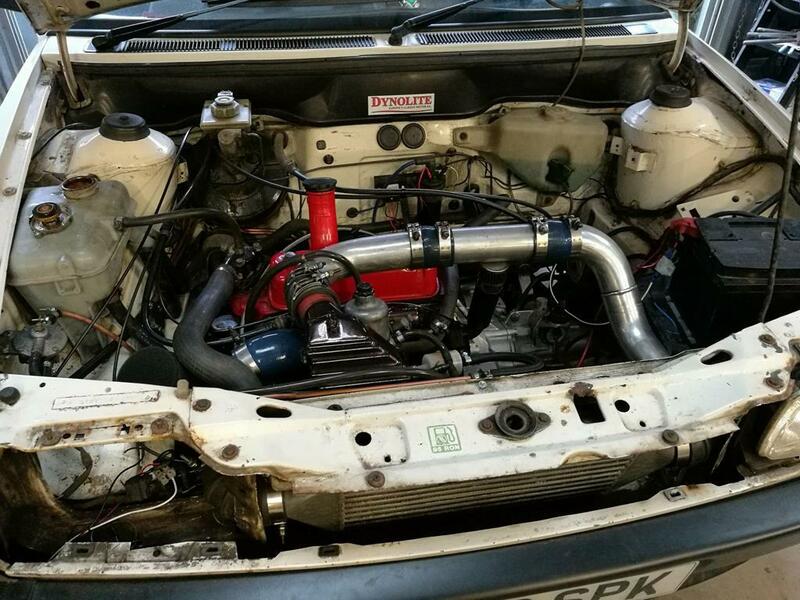 These days the A series has been thoroughly tuned and a lot of strengthened parts made meaning it can reliably put out well over 100bhp, much more when using exotic heads or forced induction - the Achilles heel always being the ability of the in-sump gearbox and the drop gears to cope. I don't really know about the origins or strength of the Maestro box but it seems to me that if you really like your A-series engine but were looking at a swap for 5 speeds and reliability then this could actually be an intriguing prospect. It would seem going EFI would do away with the dizzy on the "back" of the block and enabling a TB to be more remotely mounted to do away with the carb sticking out the front of the engine might assist with the obvious clearance issues from having the engine "reversed" in the engine bay or if you want to go nuts, going to a x-flow head would give the usual layout we are using (exhaust on front, induction on back). Last edited by Oz; 01-11-2018 at 02:54 PM. The cost of putting together a decent 100+ bhp A-series is still eye watering though. For price of an exotic cylinder head you can get yourself a B-series and gearbox and laugh at the reliability of the A-series. I guess I'm coming from it from a different angle, my motivation was not to do the job cheaply, it was to do it exactly as I wanted it and the cost will end up being whatever that is. When viewing it from there I just feel that if you really wanted to keep an A series then the cost of building a decent one would just be what it would be. Good find OZ ! I keep hearing about how bad/week , mini gearboxes are !! I can see why it has this reputation! There's a bomb proof box from the mid 1960,s to early 1970,s, it's buitifull C,R and will take everything you throw at it , major problem is ,, it's only got 4 gears! I mean for esey fit lol , my last is not black and white as such!! I think as far as off the shelf ratios/boxes go, the Diesel Vauxhall boxes seem to be ok.
Also using the R65 box from a Metro with a Rover K-series is also about right. Aye, I get what you mean. I've considered doing another 1380 build but then I remind myself of all the heartache and woes it caused me. It made 101bhp and lasted 11k miles (of absolute abuse) before it let go. Cost me around 4k to build 10+ years ago and totally grenaded and took my guessworks 'box out with it. Sounded great though and I do miss the ability to purchase aftermarket goodies such as KAD, MED etc. Just not the same on a metro subbie. I have actually just purchased a Maestro engine and box with this in mind, my first initial thought on receiving it though was oh dear that's a big gearbox! Looks like great minds ( well forums ) think alike ! It's the same poster in both forums. Nice to see TMF open to new ideas .... it just seems basically a load of naysayers! The Fastest Mini thing did happen even if no-one on TMF knows about it it was covered in MiniWorld at the time. Bill Sollis won the race in a KAD spaceframe IIRC. Ah OK I must hoke out my old copies of Miniworld and have a look, thanks. My memory is a bit hazy but I'm not sure it actually raced, it was either barred or it had some kind of failure meaning it wasn't able to take part. My old MiniWorld's are away in the attic but if you want to check I'd check for the 12 months of 1994 (Jan - Dec, as they were printing a month or so in advanced so the info might not be in print until after the event in August) and see if you find anything. I can try and dig through my ones at some point but it may be a while before I can do so. Maybe a bare Allspeed frame would be a good place to start ?